Desire Mad Dog RDTA Mech Kit Review - Daily Vaping Deals & The Best Vape Product Reviews at Vaping Cheap! Hot on the heals of their Mad Dog and Rabies RDAs, Desire have released the Mad Dog RDTA Mechanical Mod kit. This is an all in one integrated mechanical mod kit, where the RDTA is incorporated into the design of the mod itself. The RDTA has the ability to work as a stand alone tank, with the aid of a separate connector base and the mod will work with other 510 atomizers too – as long as they have a protruding 510 pin. The RDTA boasts a 7ml juice capacity and a large build deck with options for both single and dual coil. It has adjustable side airflow and features an ultem drip tip. I would like to thank Heaven Gifts for sending us the Desire Mad Dog RDTA kit for the purposes of this article. If interested in purchasing this Mech Kit, Heaven Gifts is offering a coupon code “MADDOG49” which brings down the price to only $49! This coupon code does expire within 1 month! Use Coupon Code “MADDOG49″ For A Discount! The packaging is fairly colorful with a cartoon like appearance in blues and greens on the gift styled box. It has the Desire logo and the paw prints from the Mad Dog line. On the back of the box we have a list of contents and the scratch & check authentication sticker. Upon opening the box, we find the mod wrapped in a plastic protective sleeve, two spare glass tanks, an RDTA connector base and a bag of spares. There is a fairly large user manual which folds out and is fairly easy to follow. The foam insert that contents are sitting in is very firm and will ensure that nothing is damaged in transit. Overall the packaging and presentation is really well done and thought out well. 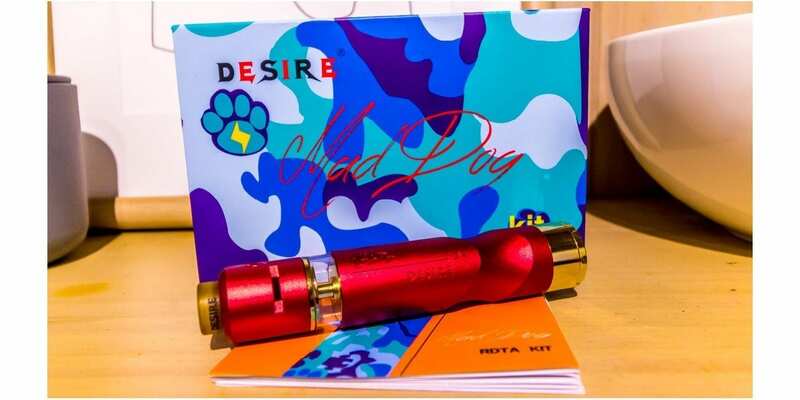 The Mad Dog RDTA kit is available in 3 colors and we received the red one. On first impressions I thought the kit looks really smart. The red color looks more magenta to me with lovely gold plated highlights throughout the RDTA and mod. Both the mod and the RDTA have the Mad Dog logo engraved and the mod has the word Desire and a star also engraved into it. There is a lovely curved contour on the body of the mod which should conform to the shape of your fingers depending on your grip. The bottom of the mod has a gold capped switch and battery contact section. You can unscrew the switch to take it from a locked position to a firing position with what seems to be an adjustable throw. And if you unscrew the cap completely you are able to insert an 18650 into the mod tube. Being a hybrid style mechanical mod, there is no separate 510 connection plate. The atomizer screws directly down into the top of the mod and its 510 connection is what makes contact directly with the battery inside. The top of the mod is a simple flat gold plated plate with the 510 screw in the middle. There is also a seal around it to accommodate the glass of the RDTA, which makes for the flush fitment. The RDTA itself unscrews from the mod and breaks down into four separate parts for ease of cleaning and building. I didn’t get any hints of machine oil so this looks like it has been cleaned very well. When used with the mod section, the glass makes a seal with the ring on the mod itself, so it technically has no base. There is a bottom base plate included, which would be needed to use this RDTA with other mods and also to check for shorts or ohms of your build prior to installing it onto the mod. The top cap pulls off and reveals and fully incorporated gold plated deck, base and connector section all in one. The deck also has a fill port on the side, to enable you to fill up the reservoir without too much effort. It looks very visually appealing as it is all gold plated and appears of high quality. The deck has the two T-shaped posts with the screws on the top of each post. It comes with an ultem single coil adapter, which sits in the unused side. The top cap has the adjustable airflow slots incorporated into it. The o-rings are also internal to the top cap, which I think is a brilliant design. They do not detract from the visual appearance of the deck section, as you cannot see them. The drip tip is made from ultem as well and sports the Desire logo on it. All in all this looks to be a really promising and well made piece of kit. The build quality seems to be of a high standard with no janky threads and really nice tolerances with all of the o ring connection points. Visually it looks really smart and I can see this appealing to the vaper who likes to have good looking, good performing equipment. I’m excited to see how this thing performs! Building on the Mad Dog RDTA is very straight forward. Installing your coils is very easy as there is a lot of room to build on the deck. It is fully exposed when the top cap is off, which means you can get in there with all of your building tools and fiddle until your heart is content. The post screws come in three types, enabling you to change them over to either Philips head, hex or slotted variety. A huge pro in my book that these options are all included as now everyone is happy. The post holes are big enough to accommodate some large gauge wire, so you can either build a straight forward coil or go for a fancy build if you so desire. There is definitely enough room to fit a 3.5mm coil in if you wish or you could go with anything smaller. Once you have clamped down your coils, center them in the middle of the wicking holes and cut off the excess legs. The fiddly part about building and wicking on this RDTA is the fact that you will have to keep taking the connector base on and off. You have to do this if you want to check your build for shorts or get an ohm reading on an external ohm reader. Then you would have to take it off again to screw it onto the mod and resume wicking your build. I’m not sure of another way around this at this stage, so let’s put it down as a subjective con. To wick the Mad Dog RDTA apply your wick through the center of each coil. Trim the ends down to either just below the wicking ports or to your desired level in the reservoir. Remember the further down into the reservoir you go, the less juice you will be able to hold. I’ve found with RDTAs that as you are constantly tilting them at an angle to vape, the wicks are constantly getting saturated that way and you are able to get away with shorter wicks. Your method may vary, however the main thing to do is ensure that the wicking ports are full, but have a little bit of room for airflow around the wick. Filling the Mad Dog RDTA kit is very easy to do. Before you put the top cap back on, fill up the reservoir from the side fill port on the side of the deck section. It is big enough to accommodate your standard needle nose bottle top or a dropper. The good design feature here is that it is on the side, away from the wicking ports, which means that your juice will flow easily into the reservoir and not get held up with the wicks in the way. Good work here Desire! To install the battery into the mod, you simply unscrew the whole bottom cap and switch mechanism. This will expose the tube and make sure you put your battery in with the positive side facing the atomizer. This is where some knowledge of mechanical mods, especially the hybrid style heeds importance. Although there is an indicator on the switch part that refers to the negative post, this could easily be missed and there is no reference to this in the manual. Please ensure you use a high rated 18650 battery that has the seal fully intact. For further information or to brush up on battery safety, please read our article here. After you screw the bottom cap back on, it’s time to screw out the switch. Turning the very bottom ring on the Mad Dog mod anti-clockwise will bring the spring loaded switch down into operating position from it’s locked position. Depending on how far out your screw it will determine the throw of the switch. You can set it to where you like it, however be warned that it will fully screw out so there has to be a limit. Once you’ve set the switch to your desired position, all you have to do is press it and enjoy your vape. Once your done vaping, remember to lock the device by screwing the switch back into the bottom cap in a clockwise direction until it is locked in and can not fire anymore. The main build I used in the Mad Dog RDTA kit was single and dual 3mm SS316L Clapton coils 26/32 gauge. I can say that the performance was impeccable and a very satisfying vape. The flavor and vapor production was on point and left me fulfilled. The mod is hard hitting and there is no delay after pressing the fire switch. This mod delivers heat to the atty instantaneously without any fluffing about. The airflow is adjustable and I had it on wide open for the most part and I had airflow for days. I felt the mod excelled in dual coil mode as the concentration of flavor and vapor is more pronounced than in single coil mode. Also in single coil mode, I am not really a huge fan of how they incorporate the single coil plug. It really only acts to block the wicking ports, rather than block off the airflow from that unused side as well. It hinders the airflow a little, but I would have liked to see it block the airflow off. Battery life was good for the particular build I was running, however being a mechanical mod it incrementally lowers in wattage as the battery drains. Mileage will vary depending on what build you run, so this will be entirely reliant on how you use it personally. I didn’t get any leaks when using the Mad Dog RDTA kit, which is a huge bonus in my book. The RDTA kept up with wicking and I didn’t get any dry hits. The switch is nice and responsive and I love how you can adjust the throw to your liking. Overall the performance and feel of using the mod is very satisfying. It’s just a nice feeling to rock it mech style from time to time and actually make that connection from a nice feeling switch. I think Desire have put together a really good kit here. And the fact that you can use either the mod or the RDTA with other components of your arsenal adds to the appeal of the Mad Dog RDTA kit. It looks good, feels good and performs well – what more could you want from a purchase. Is it worth the money? Yes, I think it is and I can recommend this device to anyone who may be interested in giving it a go. I think it is good value for money and it leaves me walking away satisfied. If the Mad Dog RDTA kit sparks your interest, I would say give it a go you won’t be disappointed you did. 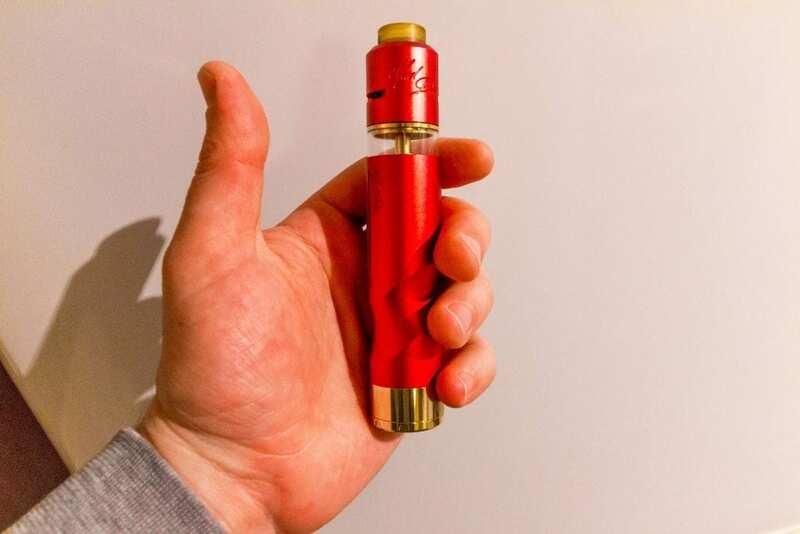 A reminder for you vapers who have not used a mechanical mod before, please read up on battery safety and have a look at some tutorials on how to build for mechanical mods – especially hybrid style. I hope this article has helped you on your quest for your next new mechanical mod. If you have any questions or comments, please leave them below we always love hearing from our audience. But i got some points to mention. – I don’t know if you received a prototype sample, but the final version has a magnet switch and not a spring. – if you want to measure your resistance, you don’t have to attach the 510 base, you can screw the hybrid connector directly to a mod. – for me in single coil mode the airflow is to restrictive when i block the opposite hole with a finger. So not blocking the second air hole with the sc adapter is a pro for me. The airflow with both sides open in sc mode reminds me of the flavor of a bottom airflow system and not of a flavor muting side airflow. – i prefer using mesh rolls in the tank and cotton only in the build deck. Rewicking is mich faster this way, no dry hits, the tank can be vaped empty in every position and no leaking( 1 night upside down and 1 night lying on the side didn’t reveal even one drop of liquid outside the atty.